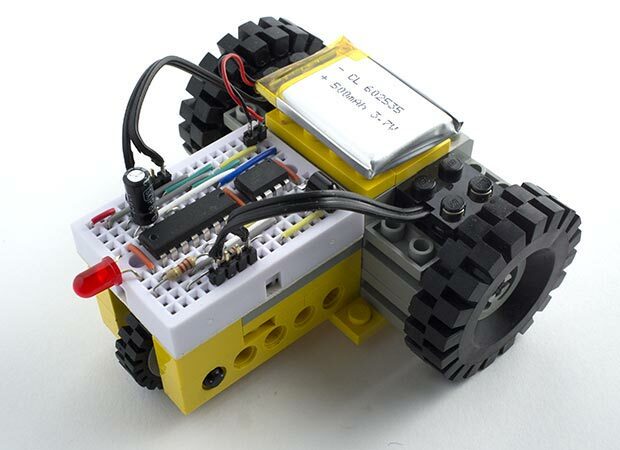 Infrared Controlled Buggy built from Lego, and controlled by an ATtiny85. My eventual goal is to make a maze-solving robot, but as a first step I decided to build a buggy you could drive using an infrared control. I plan to develop this into a more intelligent robot. To make the construction easier I decided to use standard Lego parts, and bought a cheap second-hand classic Lego Technic kit (model 8020) from eBay. To this I added two large wheels, two Lego Electric Technic Mini-Motors , and a connecting cable, again all from eBay. If you've got a collection of Lego you may already have all the parts you need. 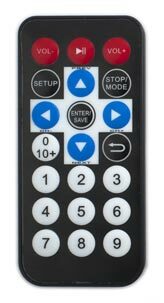 I discovered the remote control codes using my IR Remote Control Tool (NEC). Circuit for the Infrared Controlled Buggy, using an SN754410 H-Bridge Motor Driver. To drive the motors I used the breadboard-friendly SN754410 H-Bridge motor driver, which is capable of controlling two motors in forward or reverse with a current of up to 1A . 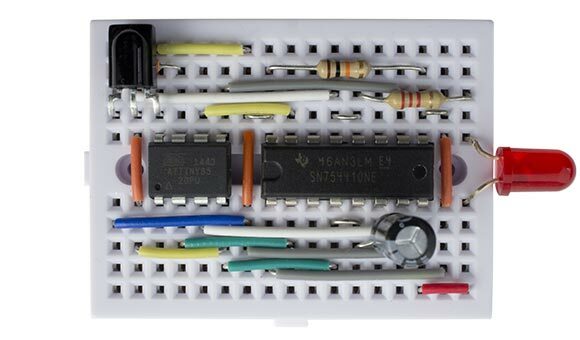 It's available from SparkFun , or Proto-PIC  or HobbyTronics  in the UK. For a good explanation of how the H-Bridge works see the Pololu site . The enable pins 12EN and 34EN are pulled high via a 10kΩ resistor to permanently enable the motor drivers. The SN754410 allows you to provide a separate supply for the motors of up to 36V, and if you want your buggy to go faster the Lego motors will handle up to 9V, but for simplicity I powered the motors from the same 3.7V LIPO battery as the logic circuitry. The 33kΩ resistor between the IR receiver and PB2 avoids errors when uploading programs to the ATtiny85 by isolating the output from the IR receiver from the ATtiny85. I included an LED to remind you that the battery is connected. Control board for the Infrared Controlled Buggy. The infrared commands are interpreted by an ATtiny85, which also controls the speed of the motors using two PWM outputs. The program decodes the pulses from the infrared receiver using an interrupt service routine, and this calls ReceivedCode() when a complete IR command has been received. The program to decode the remote-control codes is based on my earlier article IR Remote Control Receiver. sets the speed to between 7 and 127 depending on which number key 0 to 9 is pressed (I ignored the two gaps in the sequence of key codes for simplicity). The subsequent statements then set the direction of each motor depending on which direction key has been pressed. To turn left or right the program drives one wheel at half the speed of the other one, and to rotate on the spot the program drives the wheels in opposite directions. I also used PB0 and PB3 as digital outputs to control the direction of each motor. Here's the whole program for the Infrared Controlled Buggy: Infrared Controlled Buggy Program. ^ See Philo's excellent Comparison of Lego Motors. ^ SN754410 Datasheet from Texas Instruments. Note that this is more recent than the one on the SparkFun site. ^ H-Bridge Motor Driver 1A on SparkFun. ^ H-Bridge Motor Driver 1A on Proto-PIC. ^ H-Bridge Motor Driver 1A on HobbyTronics. ^ Motors and Gearboxes on Pololu.